What’s particularly important about these quotes is who made them. Not socialists. No, they were made by ardent, intelligent and reputable defenders of capitalism. For more information, read the MarketWatch essay “20 reasons America has lost its soul and collapse is inevitable” at http://www.marketwatch.com/story/story/print?guid=47729BA0-933E-4299-92CC-EB41EEE671D (reprinted below). Each of the three quotes includes the word “collapse” in the sense of a collapse of global capitalism, rather than merely a crisis in a particular part of the world system (such as cracks in the financial architecture or deflations of housing and share bubbles). What we are starting to see is collapsing confidence among the defenders of capitalism. While far from universal, it is becoming a common phenomenon among the more insightful ideologues of the global marketplace. History is crystal clear on this point: a crisis of confidence among the ruling elites of any social system is both a symptom and a catalyst of impending social disintegration (and, after a turbulent interregnum, the rise of another type of social system). Increasingly common talk among our “betters” about the possibility or probability of capitalist collapse is tightly intertwined with the crisis of legitimacy, one of the quartet of contradictions which are besieging late capitalism. The other three contradictions are the profitability crisis, the resource crisis and the ecological crisis. Corporate profitability is in overall longterm decline despite late capitalism’s frantic efforts to compensate via the ultimately self-destructive mechanism of financialisation. The system is reaching peak oil, peak water and peak farmland as the scramble for dwindling resources sparks new imperial wars. Capitalism’s predatory exploitation of the environment has unleashed the revenge of nature, facing humanity with the catastrophic dangers of climate warming. The mounting fury of this quartet of contradictions points towards only one possible outcome: the collapse of capitalism on a global scale within a historically short time span. When a country’s rulers become so isolated that they block even the “normal” evolution of capitalism, they can be ousted by a grassroots revolt without fatal consequences to the system as a whole. That’s what we have seen in Russia (1917), Spain (1935), China (1949), Cuba (1959), Czechoslovakia (1968), Nicaragua (1979), Venezuela (1999) and Nepal (2007). And so often the world system has rolled back the people’s gains as isolation gutted the revolution. The structures of a social order spanning the entire planet will be weakened to the point of collapse only by an elemental conjunction and intensification of worldwide contradictions. The quartet of contradictions eating away at global capitalism’s profit rates, natural resources, ecological stability and popular legitimacy may be slowed by intelligent policy options, but they cannot be halted. Indeed, they are more likely to be hastened by stupid policy options driven by the dynamics of competitive profiteering. That brings us full circle to the despair expressed at the outset of this story by defenders of capitalism. They feel that the financial institutions which increasingly drive not only investment strategies but also government policy have “lost all sense of fiduciary duty, ethical responsibility and public obligation”, to quote the words of US financial guru Paul Farrell. Their short-run thinking, he says, will inevitably generate “bigger, more frequent bubble/bust cycles” and the “rapid decline” of global capitalism. Self-doubt and cynicism have now taken such a hold of capitalism’s intellectuals that it is becoming commonplace for them to parody the stupidity and greed of big banks. The website of the Financial Times, that once-magestic propagandist of the corporate marketplace, hosts a side-splitting video send-up of banking practices, political economy and how everything yet nothing has changed in the last year. It features a bumptious banker saying, “Show me a stupid risk, and we’ll take it”, because governments will always shovel more money into his bank vaults. This must-watch spoof can be seen at http://www.ft.com/cms/4fe40d1a-07b4-11dd-a922-0000779fd2ac.html?_i_referralObject=10664514&fromSearch=n (also below). While tapping into a deep vein of public disquiet, the criticisms of bankers made by capitalism’s intellectuals seldom offer real alternatives because of the mental chains and social bonds constraining the critics. Socialists need to tap into the same vein, but with different objectives. That’s why Socialist Worker recently initiated a Bad Banks campaign in New Zealand. By joining the dots between big banks, which most people love to hate, and the entire workings of a world system sliding into existential crisis, the campaign aims to prepare people for life after capitalism. Different campaigns on different issues in different countries are organising resistance to global capitalism’s mistreatment of people and nature. All these campaigns are necessary, and all deserve support. Since the Bad Banks campaign in New Zealand is just one campaign among many, it does not claim any special status. And yet, in one way, this campaign is special. It targets a key driver of early social collapse: the grotesque financialisation of global capitalism. We must be prepared for that early collapse, and we must prepare others. 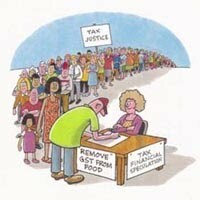 We must propose socialist alternatives now so that we prepare the ground for the green shoots of popular recovery. If you want to be part of the Bad Banks campaign in New Zealand, or spread it to other countries, visit http://www.blogger.com/www.badbanks.co.nz and email campaign manager Vaughan Gunson at http://www.blogger.com/svpl@xtra.co.nz. If you liked this story, forward it to your friends. It all helps to spread the word and make the links. And reply with your feedback to the author at http://www.blogger.com/grantmorgan@paradise.net.nz. ARROYO GRANDE, Calif. (MarketWatch) – Jack Bogle published “The Battle for the Soul of Capitalism” four years ago. The battle’s over. The sequel should be titled: “Capitalism Died a Lost Soul.” Worse, we’ve lost “America’s Soul.” And worldwide the consequences will be catastrophic. OK, deny it. But I’ll bet you have a nagging feeling maybe he’s right, the end may be near. I have for a long time: I wrote a column back in 1997: “Battling for the Soul of Wall Street.” My interest in “The Soul” -- what Jung called the “collective unconscious” -- dates back to my Ph.D. dissertation: “Modern Man in Search of His Soul,” a title borrowed from Jung’s 1933 book, “Modern Man in Search of a Soul.” This battle has been on my mind since my days at Morgan Stanley 30 years ago, witnessing the decline. No, not just another meltdown, another bear market recession like the one recently triggered by Wall Street’s “too-greedy-to-fail” banks. Faber is warning that the entire system of capitalism will collapse. Get it? The engine driving the great “American Economic Empire” for 233 years will collapse, a total disaster, a destiny we created. Has capitalism lost its soul? Guys like Bogle and Faber sense it. Read more about the soul in physicist Gary Zukav’s “The Seat of the Soul,” Thomas Moore’s “Care of the Soul” and sacred texts. But for Wall Street and American capitalism, use your gut. You know something’s very wrong: A year ago “too-greedy-to-fail” banks were insolvent, in a near-death experience. Now, magically they’re back to business as usual, arrogant, pocketing outrageous bonuses while Main Street sacrifices, and unemployment and foreclosures continue rising as tight credit, inflation and skyrocketing Federal debt are killing taxpayers. 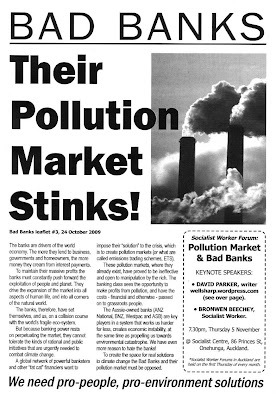 This educational forum explores why the so-called "Emissions Trading Scheme" should be more properly called the Pollution Market, and exactly how it will make our environmental problems worse. This is closely linked to the political agenda of big banks, investment drivers of the global economy and, therefore, of the politics of late capitalism. All greens and leftists welcome. 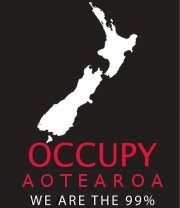 For more information, contact Bronwen i_c_red@slingshot.co.nz or phone the Socialist Centre (09) 634 3984. Bad Banks leaflet #3 is available now. It addresses the link between global banking power and the ecological crisis, specifically focusing on the banking class's prosposed "solution" to climate change, pollution markets (or as they're calling them, emission trading schemes). This leaflet has contributions on the back page from David Parker (writer for www.wellsharp.wordpress.com/), Mike Treen (Unite Union National Director), Omar Hamed (Unite Union organiser & Rainforest Action co-ordinator), and Roger Fowler (editor of www.farefreenz.blogspot.com/). The 350 movement aims to put pressure on world leaders to reach an agreement on reducing green house gas emissions at the Copenhagen conference in December. It is calling for an agreement that includes strong reduction targets for developed countries, while recognising the right of poorer countries to continue to develop their economies. Unfortunately the leadership of 350 international seem to have fallen into the trap of believing that a pollution market (which is what the Copenhagen talks aim to establish) can reduce green house gas emissions. So all though they rightly point out that “current plans for the treaty are much too weak to get us back to safety”, they then argue that, “This treaty needs to put a high enough price on carbon that we stop using so much.” 350 aren’t the only ones who have accepted the pollution market approach, the Green Party backed the first version of the emissions trading scheme when it pushed through by Labour before last year’s election. Greenpeace too have decided to focus their campaign on the target of 40% reduction by 2020, while ignoring all the evidence that shows this target will never be met through a pollution market approach. Support for a pollution market among mainstream environmental groups is a big problem, but it should stop those of us who know the pollution market model is no good from going the movement. The fact is at this stage, most of thousands of people in this country (and the millions worldwide) who will be taking part in the 350 International Day of Climate Action aren’t aware of what a pollution market really means. It’s our job to tell them. Around the world the climate justice and ecosocialist activists are organising and educating against false solutions to climate change, such as pollution markets / carbon trading, and putting forward real positive solutions that will save the climate and build a better world for all. 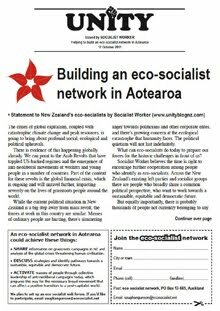 • The new Bad Banks leaflet from Socialist Worker, also announces the launch of the Ecosocialist Aotearoa Facebook group. • Climate Justice actavists are organising a climate camp in Wellington from 16 to 21 December 2009. A thousand people joined a lunch time march in Christchurch on Friday October 16, to oppose an irrigation dam on North Canterbury’s Hurunui River.The march was the biggest ever public demonstration of opposition to the environmental damage done by industrial dairy farming and intensive irrigation on the Canterbury Plains. For more information on the campaign to stop the dam here. by Alex Bainbridge Perth 17 October 2009 from Green Left Weekly Socialist Alliance WA co-convenor Sam Wainwright was elected from the Hilton Ward to the Fremantle Council in the October 17 poll. Wainwright polled over 33% (438 out of 1310 valid votes). His nearest competitor, an ALP member, polled 337 votes (25.7%). Under the new, undemocratic first-past-the-post local government electoral laws in WA, Wainwright was elected as the candidate with the most votes. In the mayoral poll of six candidates, Greens member Brad Pettit triumphed with over 45% of the vote, well in front of two fellow Greens Michael Martin and Jon Strachan. Both Pettit and Strachan were endorsed by the Fremantle Chamber of Commerce. Of the six new councillors elected there is one ALP member, two Greens, two independents and one Socialist Alliance. However under WA electoral law local government candidates can not formally run for political parties and Wainwright was the only candidate to declare his political affiliations in his campaign material. Issues Wainwright campaigned on included: making Fremantle a “fight climate change” council; better public transport, including linking Fremantle to Beaconsfield, Hilton and Samson with CAT buses; for council and community workers’ rights; maintaining the areas beaches, parks and green spaces for everyone; for rates based on ability to pay, not just house value; and council democracy. For more details of Wainwright’s campaign, visit www.samforhilton.blogspot.com. Twenty five Tūhoe and supporters in Otautahi / Christchurch marched from Te Whare Roimata community centre to Cathedral Square on Thursday October 15, to mark the second anniversary of the police terror raids. As well as a protest against the police raids on the Tūhoe community of Ruatoki and houses around the country, the hikoi was a also a celebration of Tūhoe’s long and proud history of resistance. Small protests in that big Square often feel a bit gloomy, but not this time. With colourful banners and beautiful waitata Tūhoe showed how to protest in style. For more information on the October 15th 2007 raids, check out October 15th Solidarity, and the UNITYblog archives for October, November and December 2007. Looking for Answers: A life of Elsie Locke by Maureen Birchfield was launched in Christchurch on Wednesday last week (October 7). There have also been launches in Auckland and Wellington. Elsie Locke was, as the press release from the University of Canterbury Press puts it, “an influential writer and activist”. A member of the Communist Party (CPNZ)* from 1933 until 1956, Elsie was also a member of the CP’s National Committee and a columnist in it’s various newspapers. She was editor of the CP’s Working Women magazine (1935–36), which was wound-up in order to launch Woman Today, a broader feminist magazine which continued until 1939. Elsie was also a founder of what became the Family Planning Association. Elsie was one of several leading communists who resigned from the CP, in protest at the party’s support for Russia’s crushing of the Hungarian Uprising – others included Connie and Albert Birchfield, parents of Elsie’s biographer, and Sid and Nellie Scott. However, unlike the Birchfields and the Scotts, Elsie’s husband Jack Locke remained a member of the CP and its successors until his death in 1996. It’s fair to say that it was Elsie’s achievements after leaving the CP that earned her most recognition. The fact that she was an ex-communist also made her more acceptable to establishment liberals who have honoured her with an with Elsie Locke Park in 1997, and this year a bronze bust as one of 12 Christchurch “Local Heroes”. From the 1950s, Elsie was a leading figure in the peace and anti-nuclear movements. And while Jack worked at the Belfast freezing works, Elsie worked at home, being a not so traditional house wife and mother, while writing children’s stories for the School Journal and a series of historical novels for children. The first being the much loved classic The Runaway Settlers (1965), based on the true story of a single mother who flees domestic violence in Australia and settles in Lyttleton Harbour. As many readers will know, among Elsie’s four children are Green Party MP Keith Locke (who, in the 1970s was a leader of the Trotskyist Socialist Action League) and Maire Leadbeater who is also a prominent peace activist, a former Auckland City Councillor, and campaigner for human rights in East Timor and Indonesia. Until their deaths Elsie and Jack (who died in 1996) lived at their small grapevine covered cottage it what is known as the Avon Loop on the banks of the Avon river in the eastern side of inner city Christchurch. From 1972 they were founding members of a remarkable community organisation called the Avon Loop Protection / Planning Association. Following Elsie’s death on April 8 2001, Maureen Birchfield, who’d recently published a biography of her mother, Elsie’s friend and comrade Connie Birchfield, was asked by the Locke family to write their mother’s story. The result is a big book (560 large pages) for a big life. Although I’m only half way through I can already recommend it as a interesting and entertaining read. *The CPNZ was the forerunner of Socialist Worker, publishers of UNITYblog. Above: Jack and Elsei Locke on the front step of their home in the 1980s. This and the Working Woman cover were scanned from the book. Council of Trade Unions turning towards class struggle? Could a column by Helen Kelly in last Monday's Dominion Post (below) signal a turning point for the union movement? There's no doubt that the opinion piece by the Council of Trade Unions president is significant – both for what it says, and for what it doesn't say. First of all, Helen Kelly's column connects three separate attacks on groups of workers and explains them in terms of wider economic and political forces. Her analysis is correct. Of course the disputes at Telecom, at Open Country Cheese and on the Auckland buses are related. But for decades now, it's been rare to hear union leaders to treat disputes this way. Fundamentally, what Helen Kelly is talking about is a common cause shared by different groups of workers – and a common mindset among employers. She's talking, in other words, about a class struggle. As she acknowledges, this is a shift in perspective from the leaders of the union movement. And yet, after announcing this shift in bold terms her concluding paragraph seems oddly out of place. It's an appeal for the employers (and the National-led government) to start "working cooperatively" with unions again. The jarring inconsistency is because of what the column does not say. Having explained the forces leading employers to use bully boy tactics – forces which are not about to go away – the CTU president says nothing on what unions are going to do about it. This much has not changed. For many years, the CTU has focused its energies on appeals to the government to solve the union movement's problems, rather than organising independent working class action to achieve the movement's goals through its own collective strength. It might be argued that the business pages of a daily newspaper are not the place to lay out the strategy of the union movement, and that behind the scenes the CTU is doing a lot to organise opposition to bullying employers like Telecom, Open Country and NZ Bus. But you can't rally workers, and the broader public, around a banner that's kept hidden behind the scenes. Class struggle demands mass organisation, which takes place out in the open. Somewhere, sometime soon, union leaders will have to lead. The analysis contained in Helen Kelly's column calls for a strategy of coordinated, mass resistance by the union movement as a whole. INDUSTRIAL relations in New Zealand seem to have taken a turn for the worse in recent months. Bus drivers and dairy workers find themselves locked out by their employers and Telecom engineers have been made redundant en masse and are refusing to buy back their jobs while the network rapidly crumbles. Until recently the reaction to the global downturn in New Zealand was characterised by a willingness on the part of workers, unions and employers to work together to mitigate the worst effects of the recession. The jobs summit and the nine day fortnight are examples of that. Is there some reason why it has all gone sour? Each of these disputes has different origins. Only one is straightforward, about pay and conditions. Another is about every worker's right to bargain collectively, and the last is about an attempt to shift cost and risk on to a workforce at the expense of their job security, livelihoods and bargaining power under the cloak of "contracting out" through a third party. On the face of it the global crisis has nothing to do with any of these disputes. Significantly, none of the three employers – Telecom, Talley's and NZ Bus – is in any way struggling financially. But there is little doubt that the recession is a factor in the way they are handling the disputes. Although redundancies are not being forced on any of these employers, there is an implication that workers should feel damned lucky to have a job in the current economic climate and should accept whatever wages and conditions are tossed their way. There's a recession on, don't you know? Belts must be tightened. I don't know how many holes Telecom boss Paul Reynolds has on his $5 million belt but I don't see much tightening going on there. That's not boardroom bonus jealousy. I think it's legitimate to ask why these companies are taking such a hard line against the workers who are delivering their respectable profits in tough times. The truth is that they are looking at the unemployment figures and thinking that now would be a good time to stamp on wages, hours, and workers' bargaining power. Workers will not put up a fight, they think, while fear of the lengthening dole queues prevails. Unfortunately, the employers got it wrong. Workers are perfectly capable of understanding the situation of their employer and acting accordingly. Hence the many settlements that have been reached in recent months where unions have acted reasonably and responsibly and employers have offered fair and realistic terms. Unemployment is a real fear for many New Zealanders. But there are plenty who know that their companies are doing well enough, and they are not about to bow down to employers who throw their toys out of the pram at the first sign of resistance to their plans. Both of the current lockouts are gross over-reactions. The actions of Talley's-owned Open Country Cheese in particular, where a wholly disproportionate and illegal six-week lockout has been accompanied by intimidation of union members, use of strike breaking outside labour and misinformation, are reminiscent of the bad old days of industrial strife. All this in response to the employees simply exercising their legal right to union representation and to bargain collectively. Someone is living in the past here, and it is not the Dairy Workers' Union. The union has worked harmoniously with employers and has not been engaged in any serious industrial action for more than 20 years. It is sad and so unnecessary and you have to wonder why Open Country acted with such unwarranted ferocity. Could last year's change of government be an influence? The Government wasted little time when it carne into office before forcing through its removal of unfair dismissal rights from new employees in small firms in the first 90 days of their contracts. There was no good economic reason for this move, but it immediately set a tone for its attitude to workers' rights. Cuts to public sector payrolls, moves to make the fourth week of annual leave sellable and other policies that have negative impacts on working people seem to confirm the impression of an administration more behind the cause of the employer than the employee. None of these moves would have any positive effect on the country's productivity, its ability to pull out of recession or the length of the dole queues. The Jobs Summit and support for the nine-day fortnight present a different face of the Government, albeit one which has had limited effect. We would all be better off if employers took their lead from this approach. What will be positive is employers dealing honestly and openly with unions and employees, working cooperatively in the best interests of each enterprise and not reaching for the factory keys as a negotiating tool. Workers locked-out for nine days by Bridgeman Concrete in South Auckland, hardened their picket last week and actively impeded two concrete trucks from leaving the depo, costing the company $3,000 in ruined concrete. The company responded by caving in, and lifted the lock-out. Although lockouts are legal, effective picketing – actually stopping scabs, vehicles or goods crossing the picket line – is not. Because of the illegal nature of effective picketing, the picture above is the only photo released by the NDU of this militant action. As well as lifting their lockout Bridgeman also conceded to workers’ demands for a fairer redundancy agreement that does not allow them to discriminate against union members (the original cause of the dispute). The company has also agreed, for the first time, to redundancy payments and full consultation with the NDU if planning redundancies. In a comical footnote; Bridgeman Concrete has sent the bill for the ruined concrete to the union. I wonder if they will try to Baycorp them? Bridgeman Concrete just might find that the last laugh will be on them, because Baycorp has recently been unionised by the Unite union, who are very close allies of the NDU. I wouldn’t be at all surprised if all the paperwork accidentally slipped down a crack behind some desks. All power to the gumboot. UNITYblog editor David C spoke with Green Party MP Sue Bradford on Monday, September 28, three days after she announced her resignation from parliament and return to grassroots activism. DC: Why are you resigning from parliament? SB: My decision to resign is a delayed but direct outcome of the result of the co-leadership contest which happened earlier this year. Since then I’ve done some serious thinking about what the next steps in my life should be. The Green Party made a clear and democratic decision about the style and direction of the leadership, and I accept totally the democratic decision of the party. But it left me in a difficult position. After much thought, and discussing the issue with key friends and allies, I decided the best thing would be to make a clear break from parliament, and to look for opportunities back in the real world. Politically I intend to be fully engaged. I feel like I’m going back to where I came from, to community and union activism. But quite how that expresses itself, you never know until you’re out there doing it. DC: What did you feel that the leadership contest was about? Where you and Metiria Turei presenting two different visions for the party, or just two different styles or personalities? SB: It was both. Obviously we’re very different people – different ages, ethnicities, experiences. I’m a lot older than Metiria, and there’s pros and cons on the whole issue of age. It was also about slightly different ideas about where the party could and should go. When we came into parliament in 1999 – with Nandor Tanczos and myself and Rod Donald and others – we were very fresh and new and challenging. We presented a radical image and a radical reality. We were challenging the existing grey old parties. We had a lot of great policy and new ideas and some big issues to campaign on, both on the social and economic area and in the environmental area. In the ten years since then, I feel we’ve become a little bogged down in parliamentary routine and the detail, and perhaps we have lost some of that fresh radical edge. Radicalism is not about age, it’s about a state of mind, about always being open to change, and about trying to be out on the edge of the politics that we believe in. In losing some of that freshness and that willingness to be out there and radical and risk-taking politically, we’ve to some extent lost our point of difference with the older parties. DC: What are some of things about being in parliament that bogs you down? SB: Or bogs the party down? SB: There’s a huge amount of detail to deal with on any piece of legislation, in select committee and in the House. All the legislation we deal with is very detailed and we do have to engage with it and do a really good job on it. Sometimes that can become a little overwhelming and become the primary focus – the detail, rather than the broader picture. One example of that, where I think that we’ve become a bit bogged, is in the area of climate change, which has to be one of the key issues of our day. But I think that we have tended to get bogged in technicalities, rather than accepting and understanding that it is an economic issue and must be treated as such. We should be presenting a radical analysis of climate change and the solutions to it. If I had become leader I would have liked us to have been engaging in a really lively dialogue with the young climate justice activists – who have what I think is a cutting edge analysis about climate change – rather than just seeing it as a question of how to compromise on emissions trading schemes. DC: Obviously the emissions trading scheme being introduced now is terrible, but do you think emissions trading schemes can solve the climate crisis? SB: No, not at all, I think that emissions trading schemes are just another capitalist game, using a failed market model. There’s not even any accurate way of measuring emissions. The key thing about climate change is that all countries and all governments around the world have to cut emissions. That comes down to having the political will to do the things that are necessary. While technical issues are important, that’s not the main thing, it’s a question of political will. And behind that is the issue of in whose interests do we cut emissions? Do we do it in a way where the low income and ordinary people in our society can survive? Or do we do it in a way where it just exacerbates the growing gap between rich and poor? That plays out internationally where so far it’s the poorest nations that have already copped it the worst in terms of the impacts of climate change, and if we’re not careful that will continue to get worse. So there’s a kind of neo-colonialist thing going on with the response to climate change. DC: The Green Party prides itself on working in a different way from the other parties in parliament, but one thing where it does seem to be following the model of the dominant parties is that the MPs seem to be the dominant force in the party and the party seems to be largely an electoral machine, would that be fair? SB: I don’t think so actually. I think there’s always going to be a tendency for any party that has elected MPs for the caucus to be powerful and dominant. The Green Party has always worked very hard to try and maintain as much as a balance of power as possible. We have quite a complex structure. We have the caucus and we also have two other parts of the party that are supposed to balance that, which are the party executive and the party’s own leadership – our co-convenors – and then the policy network, which is a policy-making and approval wing of the party. So there’s three branches. The other two branches are really there to try to counter-balance the MPs. I’m not saying that it works perfectly, but our people are strong on having their voice heard, and if MPs do something that annoys them, they tend to make a pretty loud noise about it. And they do hold the MPs to account if they think they’re going crook. DC: You gained a reputation – which I think surprised a lot of people – of being someone who could put together deals across party lines, particularly around Section 59, the private members bill that gave children the same legal protection from assault as adults. Coming into parliament, your opinion say of National Party MPs probably wasn’t all that high, I just wonder, how you found it working alongside the people responsible for Rogernomics and the benefit cuts in the 1990s, and all those things that you’d fought against? Obviously you have to be civil to them... Was that a hard thing to do? Did it change you opinion of those people? SB: It was certainly a very rapid learning curve during my first days in parliament. Within a few weeks I’d been placed on the special select committee dealing with the Employment Relations Bill and the re-nationalisation of ACC. This was in very early 2000, and that was the ideological battleground of that time. So I found myself sitting on a select committee with people like Max Bradford and Lockwood Smith and Richard Prebble and other key architects of right-wing economics in this country. I had to learn very fast how to operate in that context. As well as being lobbied by major insurance companies, the Business Roundtable and people I’d always just seen automatically as the enemy. It’s part of the job, learning how to work with MPs from across the House and with lobbyists from wherever. And I came to feel very strongly that even though some of the lobbyists – not just on those bills, but on many others of course – are diametrically opposed politically to where I come from, and from where the Green Party comes from, I still felt an obligation to listen to them, and to be civil and respectful and to try and pick up any points that might be good. The same with submitters. Because if I was expecting the National Party to be civil and listen well to a worker from a Tokoroa timber mill making a submission on the Employment Relations Bill, then I had the same obligation to be respectful when I heard someone from the Employers and Manufacturers Association. It’s part of democracy to take all the opinions and ideas and experiences on board, and then come to your political conclusion about what you do about that piece of legislation. And I’ve enjoyed, and actually it’s been a privilege, to have that experience of working with people across political lines. Many of whom, in the past, would not have given me the time of day. I think that’s good in a democracy, because I still believe that it’s better that we do our politics with words and legislation, rather than machetes and guns, as happens in some countries in the world. Of course our democracy’s not perfect, but I’ve certainly done my best to try and make it work. DC: Is there any one highlight of your ten years in parliament? SB: The highlight was getting three private members bills through in the last parliament. Not just the repeal of Section 59, but the one that lifted the wages for young workers aged 16 to 17 – which has not been rolled back, thank goodness – as well as my bill extending the time some mothers can keep their babies with them in prison. So there were the legislative highlights. One of the most important things for me has been the ability, because of being an MP, to give a voice to unemployed people and beneficiaries and low paid workers, in a way that I don’t think has happened in parliament for some time. I think it probably happened back in the 1930s or earlier, when the early Labour Party came in, when there was that raw voice of what’s actually happening for real people, with poverty and unemployment. I’ve tried to give that voice expression in parliament for the whole ten years. And also other voices too, like that of people with mental illness and their families, people with disabilities, children and young people. I’ve really tried to give a voice to the most vulnerable and exploited in our society, to the extent that I could. It’s never enough. I mean I feel bad that I’ve never been able to do enough, but I’ve done what I could. DC: Are there any regrets? Anything you feel you’ve missed out on because of your time in parliament? Or anything you couldn’t do or couldn’t speak up on? There have probably been times when I’ve been held back a little bit, in what I could say. But that’s part of being part of the Green Party caucus, with collective caucus responsibility. When you’re part of a political party, there’s a commitment to being part of the group and representing the group, rather than yourself. That’s important to me, I don’t believe in individualism in politics. That’s added to by the fact that you’re a member of parliament and very visible, so at times I guess I would have been a little held back, but not much. DC: You’ve said in one of your recent statements that you’re still a radical. DC: Are you still a socialist? DC: Did you find it difficult to retain your radical politics in parliament? SB: No, I haven’t found it difficult at all. I’ve found it hard, in recent decades, to identify myself with a label. When I was young it was easy, we all called ourselves labels. As you keep maturing in political life, it’s harder. But if anything I think I’d call myself an ecosocialist and a feminist. The fact that I’ve got a clear structural understanding of our economy and our society – and have had since I was pretty young, even though it keeps evolving and I keep learning – this is a strength in parliament. Because it means you don’t get lost in the detail. No matter what the issue was, even issues that seem quite tangential, like prostitution reform or gambling or racing, issues that aren’t right at the heart of things. I suppose you could almost call Section 59 that. But I’ve always had an analysis behind what I’m doing, and I’m always clear whose side I’m on in any political debate. And I don’t think I’ve ever sold out. DC: What does a term like ecosocialism mean to you, both in terms with what’s wrong with capitalism and the sort of changes you’d like to see? SB: That’s a huge question, you could write a book on that. I came originally from a communist and socialist background, from when I was pretty young. I kept learning through that. The big thing that traditional communism and socialism missed was what we humans were and are, doing to the earth and the physical environment around us – we just weren’t aware of it. Although I’ve come to realise that Marx actually did have some understanding about it. So in the early ’70s, when the Values Party [forerunner of the Green Party] and some of the Green movements around the world started to raise and talk about it, I began to realise that there’s no way that we can leave the environment out of the equation. We have to understand that the economy is basically a subsidiary of the environment, and that we humans can’t survive without the planet on which we depend for our existence. That means that environmental and social and economic justice issues have to be brought together into the same basket. That’s what the Green Party policy and charter are about – caring for earth, caring for people. That’s why I joined the Green Party and stood for parliament, because the kaupapa [philosophy] is one that I support. We have to do everything we can to redress the damage that we’ve done to the life of this planet, and try and nurture the life that’s on it. To do that well we also have to create a society in which everyone has a chance, and in which the gap between those who have and those who have not is diminished – and that’s the social and economic justice side of the Green kaupapa. From my frame of reference that’s ecosocialism, but of course to other people in the Green Party they wouldn’t see it within that frame at all. Ecosocialism is just one means, feminism is another. Trying to live as responsible Treaty partners is another frame of reference which the Green Party attempts to live by. So we try to do all these things and Green Party members and MPs tend to have quite diverse lenses through which we see our Green kaupapa, but I see mine through this particular lens. DC: I know in the Green Party of England and Wales there’s a group called Green Left, who describe themselves as “an anti-capitalist, eco-socialist current within the Green Party”. Would something like that fit in with the way the Green Party operates here? SB: I’ve been interested in how they do that do that in the UK. But I think that we have a strong culture in the Green Party of Aotearoa not to form factions. Right through the time I’ve been active, since ’98, there’s been a real strong commitment from people not to form either closed or open factions. It’s a big no no, people wouldn’t like it. Beyond that, it may be that our party is too small to sustain that kind of open and clear factionalism that characterises other Green Parties and parties like the Labour Party here. I don’t know what might happen in the future. But it certainly not a direction I’m looking at taking. DC: Now that you’re going back to the grassroots, what’s the first campaign that you think you’ll get involved in? SB: It’s too soon to say. I’m very conscious that things change all the time. There are different campaigns happening at the moment and new ones arising. I will build on my current union and community base and probably start going to more demonstrations and more meetings, and just work my way into it. There’s so much work to be done, but to be any use one has to focus. And I’m not ready to make those kinds of decisions yet. DC: One of the campaigns that’s going on is the Bad Bank’s campaign, and you’re speaking at a public meeting on Thursday night. Why did you agree to speak at that meeting? Why do you think the banks and their behaviour is an important issue? SB: For the last 30 to 40 years we’ve seen the world economy run to meet the needs of the banks and financial institutions of capital, rather than in the interests of everyone else in society. The role of banks and the financial sector is a key issue, both locally and internationally. It’s important that we analyse what the banks and financial institutions have done and are doing. It’s really important to expose what they’re doing, but also to come up with some solutions, because we still need money as a means of exchange. So I welcomed the opportunity to speak at the meeting and to see what’s going on with that campaign. DC: One last question. Will the SIS be re-opening your file?